Communication has always been central to warfare. 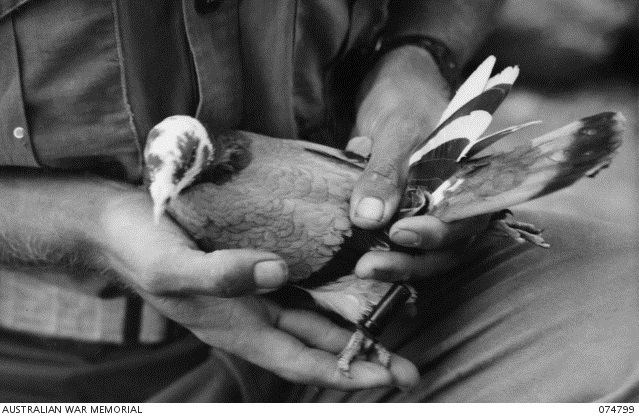 Carrier pigeons, flags, field telephones, Mel Gibson rushing through the trenches in the Gallipoli movie, the sergeant charging back and forth endlessly in episode 1 of the Gallipoli TV series, all those resources, human and technical, devoted to getting the orders delivered and the messages disseminated. The relationship between the Memorial and Honest History has always been a touch fraught. Eighteen months ago, when our website was barely underway, we had a baptism of fire in a meeting with Memorial management at the very top level. In this meeting, we found ourselves put in the class of people ‘who think they are better than everyone else’, we were told Honest History was ‘not a force for good’, and we were criticised for lacking ‘situational awareness’, that is, for asking awkward questions about Australia’s war history during the commemoration of the Anzac centenary, then just gearing up. We argued back but it was perhaps not surprising that our proposal to keep in touch with the Memorial, through participation in staff seminars and such, was met with the formal version of ‘not on your Nelly, mate’. We left the meeting feeling bullied, bloodied but unbowed. Since we began our website, we have advised the Memorial every time we have published a substantial article referring to its work. We have said that we would print unedited on the site any response that was forthcoming. We have made the same offer to the Department of Veterans’ Affairs and the Minister. We receive comments from members of the public; we have never edited and we have never failed to approve such comments for publication. The Memorial and the Department, we felt, deserved the same courtesy. 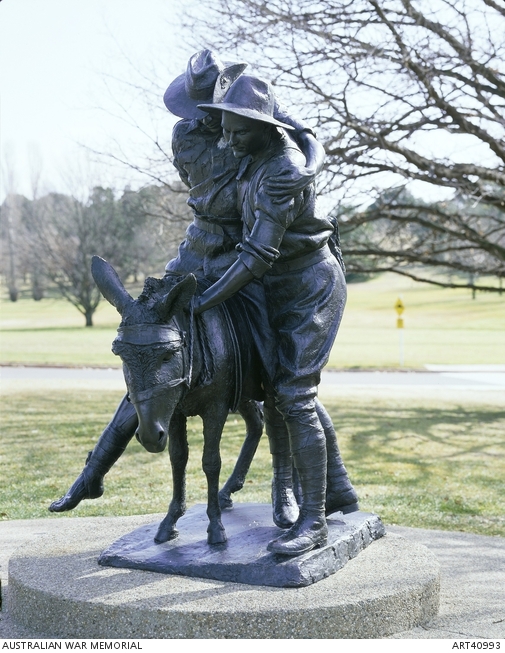 Simpson and his donkey, 1915, Peter Corlett, bronze 1987-88, outside the Memorial (Australian War Memorial ART40993). Simpson, ‘[a]rguably Australia’s most famous soldier’, according to the Memorial’s website, arouses strong emotions and not just among children. Further discussion. For a while, our polite advices elicited equally polite ‘thank you’ messages from Memorial management. Not any more; not for some time. Not even a ‘read receipt’ message; perhaps someone has learned how to switch off this function. Perhaps our polite messages are disappearing into the silence, unheeded. That seems a shame. In this Gallipoli centenary year, the only indication we have had of how we were being received at the Memorial was an email message in January from very top level management there. It was clearly sent to us in error but we noted it carefully nevertheless. Honest History and its works were well known to the Memorial, the email said, but we simply didn’t ‘get it’. We wondered what the ‘it’ was that we didn’t get. Was there only one of them? Was it somehow related to ‘our story’ as in ‘Every nation has its story; this is our story’, the Memorial’s standard one-liner? Should we try harder to ‘get it’? Or should we stick to our own line that, while war was important in Australian history, so were lots of other things? That, in fact, Australia had many stories. We stuck to our line. We also began to employ metaphors to describe what seemed to be happening in our dealings with the Memorial. For instance, ‘When one disturbs sacred cows, the cowherds are provoked also’. As for the ‘no-speakies’ phenomenon, we were familiar with the standard corporate tactic of denying oxygen to one’s critics but we felt it was always a rather juvenile ploy. If organisations like the Memorial felt they had a good case, in our experience they usually spruiked it and took on all comers in the marketplace of ideas. On the other hand, we also had some experience of organisations which felt the one true faith had been revealed to them and who thus saw no need to discuss it with people who had a different view. Some fundamentalist religions sprang to mind as examples; they prefer pulpits to debates. We felt the need to get closer to the Memorial. Then, out of the blue, an opportunity arose. While we were checking the Memorial’s website for something else, we came across an advertisement for the ‘Hands on History’ holiday program for children. How children learn about war had long been an Honest History interest so we decided to attend a ‘Hands on History’ session and write a piece about it. As a courtesy, we advised the Memorial of our intentions. We were particularly concerned that the program presenters should not feel inhibited; we even said we would not go ahead with the visit if there looked like being a problem. After further discussion, we were ‘good to go’ to ‘Hands on History’. We had two ‘minders’ there, one from the communication and marketing and one from the education area of the Memorial. They were friendly and facilitative. There was no sign that the presenters were inhibited by our being there. The education area provided answers to some written questions we had submitted. There was even a tentative suggestion made to us that we might come and talk to the education team. We published our description of the ‘Hands on History’ session and some more general material. We noted in the article that people at the Memorial would not necessarily agree with our conclusions. We then emailed the head of the education area, offering to come over and talk to the education team, recalling the suggestion made to us earlier. A response came, not from the education team but from communications and marketing, who were annoyed that we had not come back through them, as they had facilitated the contact with the education team. We apologised but said it had not occurred to us that contact in this filtered way was necessary. We noted that we had made direct contact with sections and individual officers of the Memorial on previous occasions. 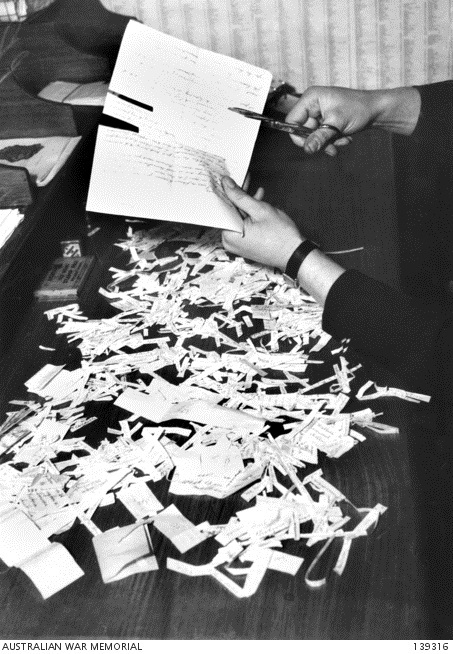 We write on behalf of the Australian War Memorial re your direct approaches to staff seeking access and information. As you would be aware, the Memorial and its staff are very busy on a broad range of fronts around its ongoing day-to-day activity as a Memorial and shrine, hosting some 200,000 school children each year and some 1 million visitors in total per annum, organising and conducting commemorative events and ceremonies in honour of all conflicts, and ancillary activity around media and corporate liaison. While we note your comments that you are not a journalist, we do consider the Honest History website is a media site and, accordingly, we are requesting you make your future approaches through the Memorial’s media area within the Communications and Marketing Section. The media area and its staff are happy to assist with your queries and recently facilitated your visit to the Memorial to view the Hands on History sessions as well as supplying a detailed response to your queries. Could you please observe the Memorial’s media protocols and come through the media area in seeking to get further information on the Australian War Memorial. We remain ready to assist as we can. Please call me with any comments or queries you may have. To this advice, Honest History responded that it was useful to have the position spelled out. (We could not find on the Memorial’s website an equivalent protocol applying generally.) The protocol raises a couple of practical issues, however. For example, if an Honest History representative goes to the Memorial in person to do a review of an exhibition and has a question about an aspect of the show does he or she have to find one of the Memorial’s communication and marketing team to ask the question? Or, the next time we get a request from a section of the Memorial to publicise something on the Honest History site, do we have to respond to it through the communication and marketing people? Are ‘our communications people’ expected always to talk only to ‘their communications people’? It’s a recipe for Chinese Whispers and distorted messages at action officer level but plenty of work for spinmeisters. Anyway, that is where things stand at present between Honest History and the Australian War Memorial. There is a hint in the above email that Memorial staff are too busy to deal with Honest History but we don’t believe Honest History has been a frequent, vexatious or bothersome inquirer. It is a pity that people at the Memorial are not able to talk to us directly rather than through a filter. They could take the opportunity to tell us where and why we are wrong; we would welcome that. The attitude behind the protocol is more important than its words, however. Putting aside its quibbling about process, the protocol indicates there is at the Memorial an unwillingness to engage in robust discussion about the nature of commemoration and the presentation of history, now and in the future. We in Honest History reckon that we have had constructive, useful things to say about what the Memorial does and could do – and that we have said them at far greater depth and with more care about evidence than many other observers. We intend to keep doing this, with or without engagement from the Memorial. We are not the Memorial’s enemies; we are its constructive critics. Some of us now involved in Honest History spent a good part of two years of our lives from 2011 successfully lobbying against a silly plan by some Canberra citizens to build separate World War I and II memorials which would have rivalled what we saw as the ‘real’ – and valued – Memorial. We worked harmoniously in this campaign with former senior Australian Defence Force officers. More recently, we believe Honest History has been a publicist for the Memorial, while asking fundamental questions about its role. These questions are rarely asked by the mainstream media (with some honourable exceptions, like Paul Daley of Guardian Australia), which easily slips into ‘repeat story’ or cliché mode when covering a commemorative occasion or the Memorial’s latest acquisition of ancient war materiel. Facilitating, promoting and lapping up this sort of pap has ill-prepared the Memorial for contesting against divergent views. 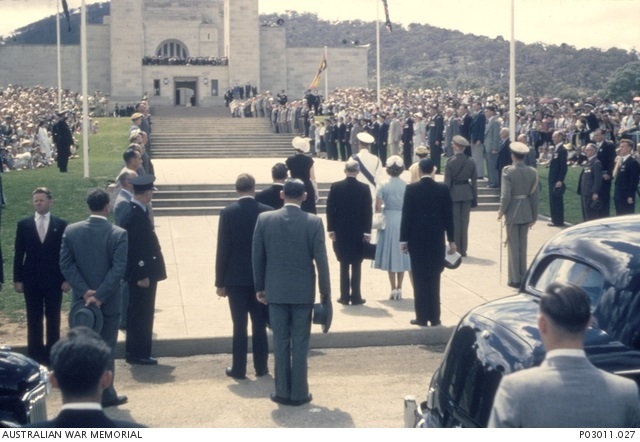 If what Honest History has said over the past two years has not always been to the Memorial’s liking or has not been within the narrow confines of the Memorial’s received view of Australian history, then that is its problem, not ours. 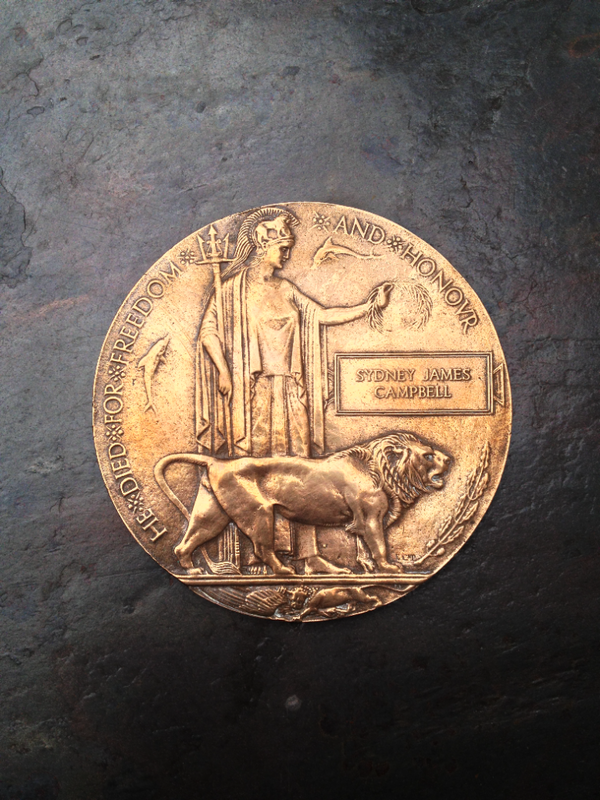 We are simply exercising the freedom that is referred to on those Dead Man’s Penny medallions that came to families of dead soldiers in the Great War, the ones that said, ‘He Died for Freedom and Honour’. That freedom surely includes the freedom to question, the freedom to criticise and the freedom to advocate forcefully an alternative view – the freedom not to ‘get it’.